Sydney Alliance brings together a wide spectrum of churches, unions and community groups. Geoff Turnbull explores this new force in Sydney’s civil society debate. Sydney Alliance publically launched its agenda for the 2015 NSW State election one year out on 26th March 2014 at Sydney Town Hall. This followed months of listening sessions conducted by Alliance member organisations and the Alliance regional groups to hear about the issues that were of concern to everyday people. In November 2013, 270 representatives had packed out Granville Boys High School to listen, discuss and judge what three areas would be on their city-wide action agenda. In the end it was decided the Alliance would work for the next 18 months on Sydney’s housing crisis, improving the transport system and expanding the reach of the Aboriginal job creation program to migrant and disengaged youth across the city. Teams undertook further in depth research into each of the issues to arrive at specific actions for each campaign to bring to the March 2014 Assembly. The “ask” from the Assembly can be found in the box at the end of the article. An organisation that has a deliberate deliberative approach to choosing the issues to campaign on is in itself reasonably new to Sydney, but the potential is the diversity of large union, religious and community organisations that make up the 49 partner organisations sitting around the table. Sydney Alliance brings together the NSW Jewish Board of Deputies with the Arab Council of Australia and the United Muslim Women’s Association. The Baptist Union and Hope Street joins with Catholic Dioceses, schools, services and religious orders alongside the Uniting Church Synod and many of its individual parishes and agencies. In the Union membership is Unions NSW, The Construction Forestry Mining and Energy Union, the National Tertiary Education Union, NSW Nurses and Midwives’ Association, United Services Union, Rail Tram & Bus Union and United Voice. A broad range of community organisations are also members including Cancer Council NSW, Youth Action, Settlement Services International, Sydney Marae Inc, Climate Action Network Australia, Dress for Success Sydney, Asian Women at Work as well as many regional, migrant, legal and community services. Worryingly for government at all levels, the Sydney Alliance has been training US style community organisers for the last 5 years and it is setting up regional groups across Sydney to bring the grass roots of their diverse memberships together to listen, research and undertake more localised civil society actions. One regional group has worked with Koori Job Ready, Glebe Youth Services, the CFMEU and Mirvac to get local Aboriginal youth apprenticeships at the Harold Park Housing Development. Another group used the lead up to the council elections to obtain patient drop off zones in front of medical centres in Liverpool after listening to stories about people getting parking fines dropping of sick and elderly patients. The NSW Government has previously run up against Sydney Alliance in the Action to save Boxing Day. That story is worthwhile telling as it illustrates how the Alliance can work. During 2012 the NSW Government undertook to business that it would relax working restrictions on Boxing Day. Shop employees were concerned that they would lose valuable family time together over the Christmas break. The Shop Distributive and Allied Employees’ Association of NSW and other members of the Take the Time Coalition took the issue to the Sydney Alliance to see if churches and other Alliance members were prepared to be involved in a broad based campaign to stop the Government’s plan. The Alliance agreed and began the organising legwork to analyse the issue, the decision makers and how it could be stopped. The action cumulated in a work/life balance forum aimed at encouraging the Hon Rev. Fred Nile MLC, who held the key vote in the NSW Upper house, to publicly commit to opposing further deregulation of trading hours. I was one of 25 people undertaking Sydney Alliance’s National 6 day residential community organiser training that helped run the forum at Wesley Mission’s Lyceum Theatre, a place where Rev Nile felt at ease. The room was largely occupied by retail workers there to tell Rev Nile about what Boxing Day meant to them and their families. The capturing and telling of powerful personal stories about how an issue affects everyday people is an important part of the Sydney Alliance process. Present also were a good selection of senior church people and representatives from many of the Alliance’s member organisations. As part of Alliance actions representatives from member groups publically acknowledge their organisations support for the action. The stories resonated with Rev Nile an ex-shop assistant who feels strongly about families spending time together. When he publically committed to not supporting the erosion of family time on Boxing Day a well-oiled audience of 200 union, church and community people, irrespective of their personal feelings about Rev. Nile’s position on many other issues, rose and delivered him a standing ovation. Rev. Nile had the power to kill the legislation in the NSW upper house and on this issue he had promised Sydney Alliance his support. In the lead up to the action the Alliance had set up a meeting between the union and the then Treasurer Mike Baird over the issue, but no change had come from that meeting. After Rev. Nile had agreed to attend the forum the Treasurer had also been invited but declined. A few minutes before the forum commenced the Sydney Alliance Organiser, who had been working for months on the action, was rung by the Treasurer and advised that the Government would withdraw the legislation for the time being. The announcement of the phone call at the end of the forum was a great cause for celebration. This kind of action was what Sydney Alliance was set up to do. In London in 2007 a similar group, the South London Citizens, had successfully embarrassed the Tate Modern Gallery into paying its cleaners what the Greater London Authority calculated as being the London Living Wage. It is based on the long tradition of US community organising in particular on the work of the Industrial Area’s Foundation (IAF) founded in 1940 by Saul Alinsky and subsequently guided by Edward Chambers. Sydney Alliance grew out of the frustrations of Amanda Tatersall who, after years of organising in the union movement and on social issues, went looking for a better way of building successful coalitions. Her investigation documented in her PhD and book Power in Coalition, lead her to adopt the IAF approach to organising and to set about building the Sydney Alliance as one of IAF’s 60 partner organisations around the world. While work started to build Sydney Alliance in 2007 it was not until September 2011 that the Alliance went public with its foundation assembly. In the meantime it sold the concept of the Alliance to organisations, recruited members, provided training and then in 2010-11 held an initial listening campaign among its members to identify issues from which the Alliance’s initial campaign agenda was drawn. The process strengthened organisations and in the case of some unions reportedly changed the way they worked with their members and with people outside the union movement. The Sydney Alliance is about … building community leaders inside their partner organisations … and taking action for the common good. It is important to understand the Sydney Alliance is about training people as much as it is about social change. They see themselves as building community leaders inside their partner organisations, strengthening relations between organisations and taking action for the common good. Actions are about training people as much as they are about winning some achievable outcome. Sydney Alliance has survived the first few years and is both deepening and growing its influence so people need to be aware of its existence and to look at how they might relate to it and work with it as the opportunities arise. At an organisational level the Alliance is self-funded by its members and membership for small organisations is prohibitively expensive, although where the Alliance is working on issues with smaller organisations it encourages involvement in all but ultimate decision making activities. One of the benefits of membership is that organisation members can access free two day organiser training, so if someone is a member of one of the Alliance’s member unions, churches or community groups they can access this training and bring those skills back to local groups and issues. Similarly, if you are involved in a member organisation and are looking to become involved in action for change, then Sydney Alliance can provide you with an avenue for following up your interest, training you in different aspects of organising while working with people in your organisation or region who are also interested in bringing about change. Where you are already working on an issue or in your local area, your issues may not be easily winnable nor get the broad popular support needed to be on the Sydney Alliance agenda city-wide or at a regional level. In that case some new tools for your local campaign might be all Sydney Alliance can offer. This can leave some change activists feeling as if they have little in common with the Alliance. 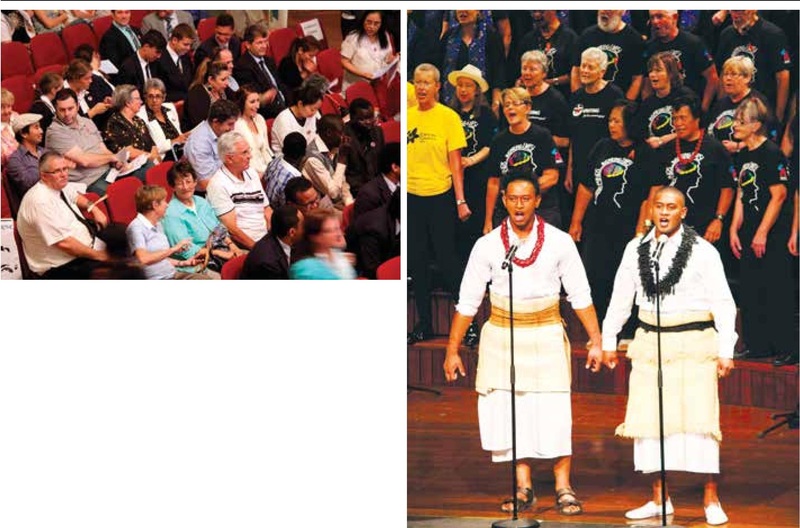 Some people react to the Sydney Alliance as having an almost American evangelical feel – which is unusual for something supported by non-evangelical churches and unions. Actions are heavily choreographed with floor teams and at the last assembly there was even a choir that brought together the religious, union and multi-cultural community music traditions. The American model being picked up from IAF brings with it some cultural aspects and is yet to adjust to Australian ways. By its nature though it is training people in new ways and inevitably that comes with a formulaic approach often seen in new converts to any world view – political or religious. Over time this should mellow. Disappointment has been expressed by some who have met with research team members about the lack of understanding of the complexities around particular issues, and the disconnect between the advice given and the final recommendations for action. Research team members are not necessarily experts – their role is to meet the experts to explore evidence for policy development and collaboration with others working in the area. However there appears to be a gap between an evidence based policy approach and the collaborative decision making of the Sydney Alliance as they seek solutions that are acceptable to the broad Alliance membership. Sydney Alliance is learning as it goes, it is already changing the way some large organisations go about their civil society interactions and it is making widely available to those under its umbrella tools and methodologies used successfully for many decades in the US by the civil rights movement, religious and labour organisations. This is a very different approach to the issue based approach that many of us have experienced. It is as much about building the people and organisational capacity as it is about the ability to undertake a winnable action within a limited time frame. Local community groups and activists need to be aware of the Sydney Alliance, how it operates and how it may, or may not, mesh with their local activities and campaigns. Sydney Alliance looks like it will be part of the social change landscape into the future. Supporting disadvantaged communities with good jobs that change lives. We’ll start with a specific ask in Glebe, that once evaluated, can be taken to all parts of the city. Facilitate a cross portfolio expansion of this innovation so the role can be expanded to other communities. The following three issues are time-specific, concrete, affordable and achievable over the next term of government. Each is about better using the infrastructure we already have. Remove the extra station access fees charged to people who use the airport train stations, to make public transport to the airport affordable for all. Commission a public feasibility study into the construction of a park-and-ride interchange on the Olympic Park line, to enable an express train service from the end of the M4 to Central Station. Answer why the NSW Government is behind in their program to upgrade train stations across the City, and what they are doing to get things back on track … starting with installing a lift at Arncliffe Station. Make public the outcome of the evaluation process for access upgrades and to ensure that all train stations are fully accessible by 2020. Establish a quality, permanent, affordable shared equity scheme. Further details about Sydney Alliances Agenda for the Common Good for the election year can be found on their website at www.sydneyalliance.org.au. Geoff Turnbull has undertaken 2 and 6 day training with Sydney Alliance as a member of the Uniting Church and has participated in two inner city Alliance regions and various Alliance activities. He is also involved in local community groups and campaigns unrelated to the Alliance. ◄ Boarding House Regulation – Who is winning?